At one time, a great crowd followed Jesus for three whole days and nights. The people haven’t eaten anything and they were very hungry. Jesus made the people sat down in rows. He took the bread and the few small fishes and gave thanks to God for them. After He had blessed the food, He gave it to His disciples. 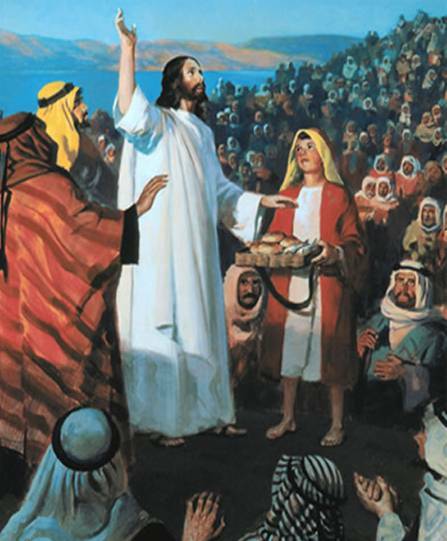 The disciples then distributed the seven loaves of bread and the few small fishes among the people. The people ate all they wanted and felt very full. There were lots of leftovers and Jesus gave command to His disciples to pick up the leftovers. His disciples took up the leftovers and filled up seven large baskets. The number of people that had eaten the bread and fish were 4000 not including the women and children. After that, Jesus sent the multitude away. He climbed into a boat and sailed across to the other side of the lake with His disciples.